I’ve made up my mind. I’ll soon be packing my bags and leaving Birmingham to pledge allegiance to the Caliphate. Thousands more, mostly from Europe, will be doing the same. As you react with horror, contemplate alerting the police and (worse) consider blocking me on social media, rest assured: I’m not referring to the so-called Islamic State of Iraq and Syria, led by Abu Bakr al-Baghdadi. 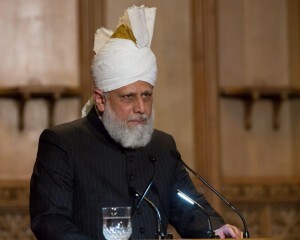 Rather, I’m talking about a Caliph you may never have heard of – and who certainly doesn’t get near as much publicity – but is the head of a global spiritual community, described as a champion of human rights and who stands firmly against terrorism. He lives in London too. This Caliph will be the centre of attention at the UK’s largest international gathering of Muslims. Thirty thousand people from 90 countries and 100 cities across the land will be there, with millions more tuning in via satellite TV screens and internet streams. Like me, they will be affirming their loyalty to him and vow to live by a simple maxim: Love for all, hatred for none. This is sure to raise some eyebrows, and probably startle those who equate caliphate with something closer to a barbaric totalitarian theocracy. And you’d be forgiven for thinking so. Caliphate, the anglicised term for the Arabic khilafah, is a system of successorship as old as humankind. But in Islamic theology, it refers mainly to the “rightly-guided” leaders (caliphs) appointed after the Prophet’s death for the protection and progress of the ummah (Muslim community). That caliphate came to an end following the assassination of Ali, the fourth successor of Muhammad. So without leadership Islam, once a monolith, gradually evolved into something quite multifaceted – and for this reason, there arose various declarations of the caliphate, from the Umayyad and Abbasid dynasties to the Ottoman empire. However, these were political manifestations of a religious institution and a far cry from how the earliest Muslims understood caliphate. For all its claims, ISIS with its deplorable fixation with beheadings and brutality, is evidently more about power than piety. Divinely-mandated authority is much more sophisticated than any random Tariq, Daud or Hamza taking over a piece of land and proclaiming themselves ruler of the believers. According to the Qur’an (chapter 24, verses 55-56), a caliphate restores Islam to its original purity, purged of the corruptions that have crept into it. It should also replace fear with peace and security. Clearly, al-Baghdadi fails on both fronts. Enter here Mirza Masroor Ahmad – the ‘true Caliph’ and head of tens of millions of Ahmadiyya Muslims who have joined the community from every denomination, religion and worldview you can imagine. Wherever on the planet they are, he is their spiritual mentor. But he is also an important figure for the world. When caricatures of the Prophet were published, he counselled Muslims to write articles promoting the real character of Muhammad. When Pastor Terry Jones threatened to burn the Qur’an, he called on faith leaders to respect each other’s holy scriptures. And when his own followers were massacred in Pakistan, he urged his community to exercise patience and offer prayers. The Caliph is committed to the promotion of the best education and health services in the poorest regions of the world, setting up schools and hospitals that provide for all, regardless of beliefs and background. He is passionate about the pursuit of secular and scientific knowledge, awarding accolades to girls and boys who achieve outstanding success in their studies. By rejecting violence, inspiring service to one’s country and defending freedom of conscience, this is a Caliph who is a living example of real Islamic values. Why should any of this matter? It’s because this is a Caliph everyone needs to know more about, and deserves the platform world leaders also want “strong, positive Muslim voices” to be given. If extremism is the “struggle of our generation”, here is a Caliph who offers hope and a solution. And that’s why millions including me are pledging allegiance to him. An edited version of this article by Waqar Ahmedi was published on Monday 10th August 2015 in ‘The Independent’ online.